The Tankerhoosen River has long been recognized as an important natural resource and a key inland watershed critical to the health of Long Island Sound. The high water quality (classified as A) in the upper regions of the Tankerhoosen River sustains a significant natural resource of the State of Connecticut – the Belding Wild Trout Management Area, one of only two Class I wild trout areas east of the Connecticut River. The importance of these small, high-quality watersheds to the downstream health of the larger river basins, and therefore to Long Island Sound, is well recognized. Of utmost importance to these high quality watersheds is protection of the headwaters regions. The importance of protecting the Tankerhoosen is recognized by both local and state agencies. The State Plan of Conservation and Development identifies the riverway as a proposed preservation and conservation area. The Vernon Open Space Plan proposes a greenway plan of 2000 preserved acres along the Tankerhoosen. Most recently, The Nature Conservancy has identified several key watersheds in the state that it considers particularly important to the future protection of Long Island Sound, including the Tankerhoosen River watershed. 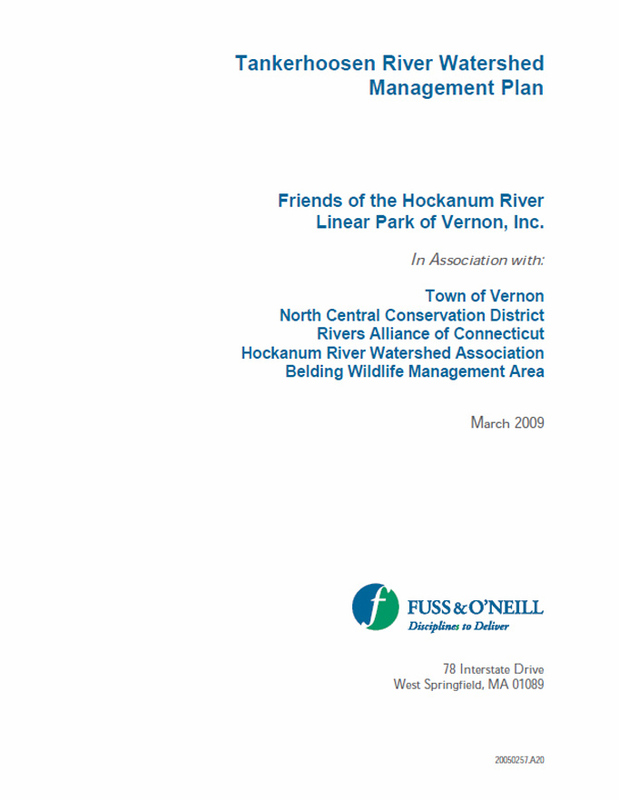 Over a four year period, completed in 2009, a study was done with Fuss & O'Neill to develop a management plan for the watershed. Some $123,000 was spent on a study — $72,000 from the National Fish and Wildlife Foundation, and $51,000 from six local organizations, including the Friends of the Hockanum River Linear Park Inc., Town of Vernon, Belding Wildlife Trust, North Central Conservation District, Hockanum River Watershed Association, and Rivers Alliance of Connecticut, Inc. Some of the recommendations have been undertaken by the Conservation Commission including Invasive Plant Species Management and an Aquatic Invasive Species Study. The recent Low Impact Development Regulations study was another result. The plan also was used in support of the recently completed Plan of Conservation & Development. There is still much work to be done to protect the watershed. Preservation and development goals often collide. Striking a balance such that the natural resources of our green valley are preserved into the future requires careful identification and diligent management of damaging impacts. The Tankerhoosen Watershed Management Plan provides a set of recommended actions that we can take to offset these impacts. The public is encouraged to become familiar with the Plan. The Tankerhoosen Valley is in our care. It is an area in Vernon that adds great value to quality of life in our community. We are all responsible for ensuring that the green valley we enjoy today will be intact for the generations of tomorrow.